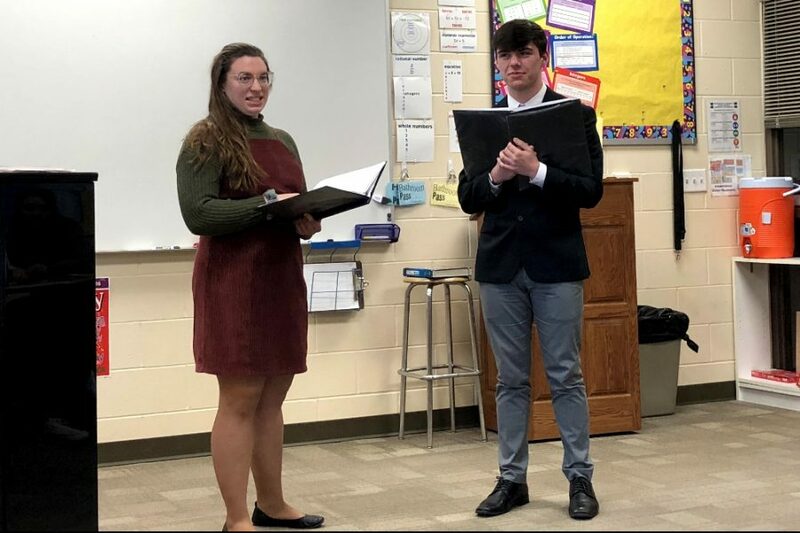 Seniors Olivia Neuzil and Justin Grawe perform a duet at the Solo and Ensemble competition held at Independence high School. On March 23, 124 students competed in 81 events at the IHSMA Solo and Ensemble Competition held at Independence High School. Thirty-three events received Division I ratings and three events received Best of Center. Best of Center is the judge’s pick of the most outstanding performers they heard all day. Soloist Justin Grawe, a women’s quartet, and a mixed triple quartet received this honor. Denise Cherry, Sheeley McMahon, Olivia Neuzil, and Grace Reiss sang in the women’s quartet. Cherry, Grawe, McMahon, Neuzil, and Reiss also sang in the mixed triple quartet along with Elijah Heims, Mikaila Neuzil, Ethan Opitz, Parker Ostrander, Grant Schnieders, Annika Sutter, and Ian Tibbott. All Best of Centers will perform at the Outstanding Performers’ Showcase on May 8 at Iowa State University.